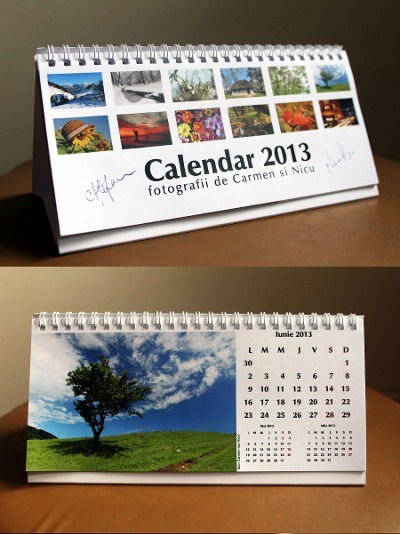 I made my own calendar for 2013: a design created with Inkscape and a bunch of photos, one for each month. It is already printed on paper in a limited edition, which will be offered with signatures from the photographers. However, I decided to put it for free download (PDFs downloadable from the same blog post) in case someone else find it good looking or useful. When a fellow photographer liked the design but witnessed his lack of design experience, I also included empty PDFs (no photos, no name) one can re-use for his own purpose. The PDFs are created to the requirement of the print shop: 220 x 100 mm, with 2 mm bleeds on all the edges. Then I decided I can be more open, I can do more: the design is made with Inkscape, a software rarely used by photographers (they will most likely do it in Photoshop), but I can share my Inkscape SVG sources: they have the months and days, they also have guides to help with alignment, they can be exported to high quality PDF and, if you want, they can be imported in a DTP application for further processing. The only downside is, I made them for a certain paper size, but having access to the sources, is easy to adjust them. The font used is Free, MgOpen Cosmetica. Still not perfect: I made the calendar in Romanian, since this is what people around me speak, but most of those reading my blog won't, so it was obvious a translation is needed, I also have an English version of the calendar design, also ready to use in Inkscape/SVG format - you just need to add your photos and name. I can already hear people telling me: you should have used Scribus instead and to some degree they are right, Scribus would have helped me with having a single PDF or source file (lack of multipage support was Inkscape's main downside for the task), would have provided better PDF output and automatic bleed/crop marks, but I feel more comfortable with Inkscape, so I used the app that makes me happier (you can import the SVGs in Scribus).